This is the story of a house church that was subjected to crackdown and looting by the authorities for four days in a row. Believers were arrested, church assets were ransacked, and houses were demolished. 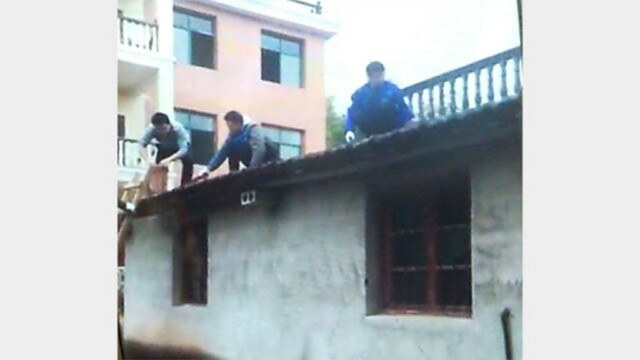 Bitter Winter previously reported that in late 2017, a house church in the High-Tech Development Zone, Xianning City, Hubei Province, was raided by the police. Hundreds of believers, who had come from out of town to attend its gatherings, had been arrested and sent back to their hometowns. In December 2018, these out-of-town believers once again gathered at the home of the local church leader, Xu Meilan. Unexpectedly, they were subjected to even more brutal violence and suppression. On the afternoon of December 1, 2018, it was raining heavily and the weather was very cold. More than 100 believers had just finished rehearsing for a Christmas performance, and were getting ready to eat at the home of their leader, Xu Meilan. Suddenly, more than a dozen town government officials and police officers arrived on the scene. The leading police officer ordered his subordinates, “Search everywhere, upstairs and downstairs! If you find any quilts or money, seize everything.” The police stormed into the property and started searching it. They moved all the quilts onto a big truck. One believer pleaded, “Please leave some for us.” However, the police were unmoved. In all, they seized at least 200 bed quilts and more than 60 benches, as well as significant quantities of food, and looted all of the church’s valuables, resulting in economic losses of at least 31,500 RMB (about $4,680). Since they were unable to stay at Xu Meilan’s home, another female leader brought the believers to her own house nearby. The house was old and cold. Since there were no quilts, the believers spent the night shivering from the cold until dawn. On the afternoon of December 2, more than 130 believers were singing hymns at their female leader’s home, when they were once again raided by the police. According to one believer, more than 30 special police officers carrying guns and shields quickly surrounded the house, rushed inside, surrounded the believers, and took photos of them. The leader and two believers were taken to the local police station. That night, the police transferred the leader to Xianning Detention Center, and detained her there for 15 days, for the crime of “holding an illegal gathering.” The other two believers were released. Another leader gathered those who had not been arrested and arranged for them to spend the night in the home of a local Christian. That evening, more than 100 believers who had come from out of town had nowhere to go, and were forced to hide out in a cedar forest near the village for the night. Among them were elderly people in their seventies and eighties, as well as children and teenagers. On the afternoon of December 4, after missing three meals in a row, the hungry and cold believers walked out of the forest and returned to the home where they had gathered before. Village officials had been waiting for them, and informed the town government. Soon, the Xianning City Special Police Unit and town government officials brought in six buses, and escorted all of the more than 100 believers to a detention house. They then dispatched an excavator to demolish the makeshift house, which had been built for receiving those believers who could not fit in the home. At the detention house, the believers were interrogated one by one, and their ID information was registered. Having ascertained that none of them was a main leader in the church, the police sent the out-of-town believers back to their hometowns. 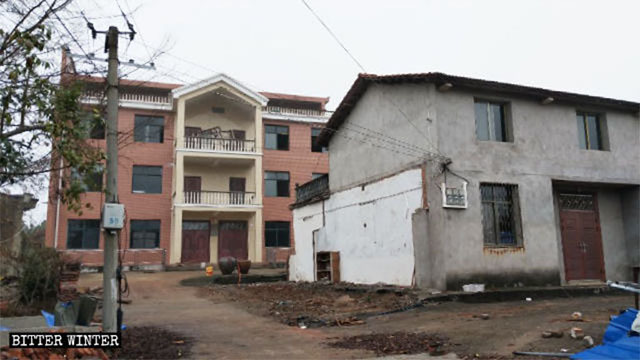 About one week later, eight people—including village officials and urban management officers—arrived at Xu Meilan’s home again, and told her, “The state forbids your belief in Christianity. After we tear down your kitchen, you won’t have any place to cook or eat, so they [the believers] won’t come again.” Immediately, they proceeded to raze the kitchen to the ground. Bricks, items from inside the kitchen, and even the cement board on the ground were all removed. 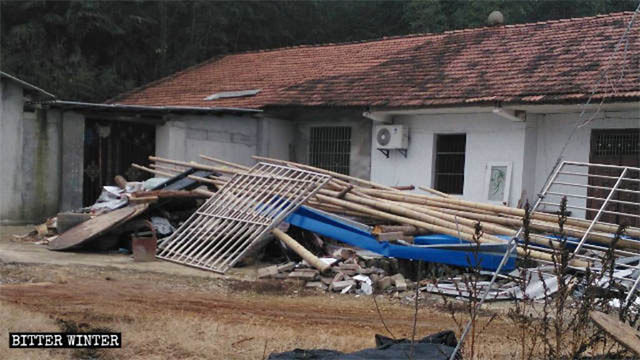 Another makeshift house, which had been built in front of Xu Meilan’s home to host the visiting believers, was also demolished. The makeshift house built near a local believer’s home was also demolished.